Thank God we partnered with David and Kathy Love six years ago. They have exceeded all expectations. As time went on in our quest for THE perfect property we realized that we needed a set of eyes and ears that cared about us to be where we needed them to be when we needed them to be there. David and Kathy were that and more. We needed a realtor to run to a property of interest immediately to get me 75 more pics and examine everything thoroughly within hours. They never failed us. We needed a realtor with patience and understanding. Throughout the SIX years of requests, they never let me down, continually working as hard for me in the sixth year as in the first. As we narrowed down to the perfect criteria, we realized that we needed a realtor to be watching and listening for what we specifically needed, who had their ear to the ground and who was networked in deep enough for us to get what we wanted before someone else did. David and Kathy did not fail us in this regard either. They were so knowledgeable about the big picture and the details. All of theses assets are critical in a realtor when you want to get the best place for the best price possible on HHI. Because David and Kathy cared about our needs and because of their hard work and determination to get us what we wanted and needed and because of their persistence and patience and most of all knowledge and experience, after six years, we were able to purchase THE perfect investment / retirement home/ family vacation and relaxation spot. The six year time frame was our fault. We had very broad and then very narrow parameters. My journey could not have been more educational, successful, and enjoyable with any other realtor and I am certain of that. If you want to end up with the perfect property for you and your family and your finances that meets your specific needs and you need to work with someone you can trust completely, who will protect you from making any mistakes, who cares more about getting you everything you need than they care about making an extra buck, who has as much or more knowledge and understanding of the market and the individual properties than any other realtor on HH then I strongly recommend David and Kathy Love. They will not disappoint you. I would gladly and enthusiastically recommend Nancy to anyone considering purchasing real estate on Hilton Head. She is always diligent and mindful of her clients wants and needs and always finds them their perfect piece of this island paradise. My wife Gail and I were introduced to David Love in 2012 by friends that had purchased a home in Palmetto Dunes. We were interested in finding a villa to purchase as a vacation home with short term rentals. We made two or three trips to Hilton Head to vacation and look at potential villas with the assistance of David. We enjoyed working with him over the months that it took to locate a villa and we did purchase in Palmetto Dunes in the spring of 2013. We kept our search to Sea Pines and Palmetto Dunes and found David's knowledge of these areas and the market to be spot on. He did not waste our time with places that were outside of our means or were in a condition that we would not have been able to move right in. One of the best things was once we were in the door at a showing and we found the interior was a dump, we did not waste time inside, but David would say “this is not for you” and we left immediately. During the years we owned the villa David and Kathy Love stayed in touch and kept us appraised of the market on the island. At the end of 2017 we decided to put our villa on the market as our needs had changed. We contacted David and Kathy during a vacation stay in August and went out to dinner with them and discussed our desire to list it. Kathy put the paper work together and a sale was closed in mid December. The negotiation was handled by David and was the quickest and easiest I have ever had. David kept us informed as the steps to a successful closing were performed, especially the inspections, and quickly handled the minor bumps along the way. Working with David and Kathy Love is just a pure pleasure. The professionalism and no non sense approach, as well as their knowledge of the markets, is unmatched. They are an unbeatable team and just great people to be around. On the day before the closing was to take place I had called Hargray (Cable Company) and found out that I needed to return the cable boxes to them. Since we were back in Pittsburgh I called David and asked if he could assist. The next day I received an e-mail with a copy of the receipt from Kathy who had driven up to the villa and made the return of the equipment for us. We intend on continuing to vacation in Hilton Head and plan to stay in touch and continue our relationship with Kathy and David on a social basis. We were introduced to David Love by our friends when we first began to consider buying a property in Hilton Head, SC. David was very gracious and patient with his time as he introduced us to the alternatives throughout the island and he appreciated that we were taking our time to determine if we were actually going to purchase a home. As David has been a long time resident, he was able to show us properties at all prices and characteristics that helped us eventually determine where and what we wanted to buy, a process that took almost two years! We finally opted for a home in Sea Pines and feel extremely confident that we found the right home for our family to enjoy for many years to come at a value that was appropriate for both the buyer and seller. Throughout the two year period, David kept us continually updated on what was going on throughout the island and made sure he shared with us select properties that he felt matched our needs. Ultimately David and his wife Kathy helped us finalize the transaction and have continued to help us as we have readied the house for our move in date. We would highly recommend the Love's to anyone who is considering buying a home in Hilton Head. In a time frame of over fifty years we have bought and sold ten homes up and down the east coast, with the assistance of realtors. When it came time for our retirement, we visited Hilton Head Island for the first time on a fact finding mission. A friend referred us to David Love. His warm friendly ways made us feel instantly comfortable. We asked him to show us everything, and tell us all that he could about the island. He complied fully with our requests ~ and with such enthusiasm about his beloved stomping grounds that we went away knowing for sure that we would be back! Since we were experienced movers we were well organized, and had a wish list of things we were hoping for in our new home. David absorbed that information, and immediately sensed exactly what kind of homes we would like. He was kind, fun to spend time with and oh, so patient. Most of all, his answers to our questions were straight forward and honest. Never did he pressure us in any way at any time. We appreciated that! House hunting was an exciting and pleasant experience with David. He made us feel like we were his top priority. He found us the most perfect house that matched everything on our "list" and we have learned in time that his information so generously shared is all true. Indeed this island is everything he said, and more, as we continue to discover the wonders of living in the most very special place we have ever lived. We have had the pleasure of working with David and Kathy for several years. During that time we have found David’s expertise on the Sea Pines market to be invaluable to helping us to understand our options and the nuances of location with regards to our investment properties. He took the time to understand our needs and to perfectly match those needs to just the right property. As nonresident owners who have purchased and sold multiple properties in Sea Pines with David and Kathy’s assistance, we have always felt that they are truly representing our best interest. We are extremely pleased with the work Kathy has done on the production and internet marketing of one property we have sold and to one we have for sale. The depth of information and the favorable exposure she created for our properties over the internet we feel is second to none. The care and professionalism that David and Kathy have given us is unsurpassed. We highly recommend their services to anyone interested in purchasing or selling property in Sea Pines. 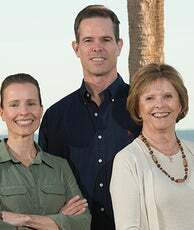 My husband Fred & I met Nancy Love at the Harbor Town Sea Pines Office in 2005 when we were on a family vacation in Hilton Head. Fred & I had been to Hilton Head several years earlier on our wedding trip. Nancy totally charmed us with her Southern ways while being every inch the professional impressing us with her knowledge and knowhow of what she called her island paradise. When we met her son, David shortly thereafter we were completely bowled over by his expertise, enthusiasm and tireless efforts to help us in our quest: the acorn did not fall far from the tree.. We later met Kathy Love who was equally good natured and made us feel welcome by encouraging us to buy the house next door. After 3 years neither Nancy nor David ever waivered in trying to help us find our piece of paradise, and we finally did it. We can’t thank the Love Family enough for their assistance and we hope to be able to count them as our first friends on Hilton Head Island. We just can’t recommend these fine individuals and realtors enough. David Love is the most fabulous broker in Sea Pines, and possibly in all the world. Looking back, the most memorable and unique characteristic of our real estate search with David was that it was just plain fun. David loves the low country, loves Sea Pines, and loves real estate. Going to see houses was a delight. We had a good time, every time. There was no hurry, no urgency, no pressure. David knows that the process can take a lot of time and he is happy to be patient. What impressed us most about David Love himself is that he listened and he responded. We felt that we were looking for something a little out of the ordinary. Probably everyone does. The point is that he listened hard to our list of wants . And he got it. He understood. Every house we saw demonstrated one or more aspects of what we wanted. David provided great background on each property from his fathomless experience in Sea Pines and was invaluable in helping us narrow our choices and focus on what would really work best for us. Finally, David provided us with what amounted to a full range of relocation services. He gave us names and contacts, advice, and assistance on everything from lawyers to doctors and dentists, from cleaning services to lawn services, from air conditioning to painting. It was terrific and saved us endless time and frustration.We were delighted with the entire experience and would urge everyone thinking about Sea Pines real estate to call David Love now. In 2005, we had owned our first Sea Pines villa for six years and were considering an upgrade. It was during one of our enjoyable bike rides throughout Sea Pines that we recognized and struck up a conversation with David Love. It didn't take long for our relationship to grow & David was great about spending the necessary time educating us on the Sea Pines real estate market, showing properties, and not rushing the process. We eventually found a property we were both very excited about. It had just come on the market the previous evening and due to high demand, there were four bidders immediately, including us. We had little time to react, but David quickly assembled our offer for presentation after consulting and touring it with us. Unfortunately, we lost to another buyer. In just one day we went from casually thinking about trading up (we were on vacation!) to being very disappointed that we weren't successful purchasing this particular property. After returning home to upstate New York, we often talked about this property. Approximately two weeks later, David called and said the original sale had fallen through and would we still be interested. We know it was David's reputation and relationship that allowed the seller to then offer us the property at our original terms. We have been very happy with this property and our ongoing relationship with David & Kathy Love. We like to stay up on market trends and Kathy is great about sending timely pertinent info requested. While David is a great ambassador for Sea Pines, he also works hard at understanding what will work for you. There is a beginning, middle, and end to every real estate transaction and the Love are well equipped to help during each of these phases. We have from time to time asked for assistance from the Love’s with ancillary activities concerning our villa since our principal residence is 1,000 miles away. They are always available, always trusted. We truly consider them now as dear friends and always look forward to getting together with them while we are on the island. There are many real estate agents on the island, but you would be hard pressed to find another couple who puts so much of their heart and soul into the business. We know the Loves stand out at the top and would recommend them highly. David Love created a superb experience for us as we searched for our first home on Hilton Head Island. He listened to our needs. He selected properties that met our needs but also offered us the chance to see what we could get for our money. He accommodated our schedule and allowed us time to consider the choices we had. His knowledge of the island and especially of Sea Pines Plantation was invaluable. Once we'd selected a home to buy, David took care of the details, working with our attorney to make our purchase was easy and painless as we could imagine, even though we completed all the work after returning to our permanent home in Indiana. David continues to be a friend, keeping us informed about what's going on in the community and in the real estate market. We stay in touch personally, getting together when we're on the island, enjoying our second home. Connect with David. He'll make sure your needs are met. We recently purchased a home on Hilton Head Island in Palmetto Dunes. We were fortunate enough to have David and Kathy Love as our realtors. We can't say enough about our experience with them. We had been looking for a vacation home on HHI for two years, using others realtors. For various reasons, we weren't finding what we wanted or needed. We quickly became confused and frustrated. Our luck began to change once we started working with David. He spent an enormous amount of time educating us about living on and owning property on the island. He helped us define what would best suit our needs. We explored different homes and villas but all with features on our wish list. Our questions were welcomed and always answered promptly. He was very patient and never pressured us to make an offer. He told us once that searching for a home on the island is a "process," and he was right. Kathy was also a tremendous help when we got to the offer stage. She represented us completely and professionally. We can truthfully say that David and Kathy are the best realtors with whom we have ever dealt. We look forward to seeing them when we are vacationing in our new home. Even after vacationing in Hilton Head for over 20 years, we still found the prospect of buying property long distance to be a daunting prospect. David Love made the whole experience from initial email to closing day a well-executed event. From the personalized web page designed by his wife Kathy which was updated daily to superb photo coverage and analysis of properties we were interested in, David provided tremendous service every step of the way. Without David's positive attitude, attention to detail and almost daily involvement our deal may not have closed. In addition to the real estate component, David went a step further and introduced us to other service providers which kept the deal moving forward and gave us peace of mind. We think David is an exceptional real estate professional - as well as someone with great personal skills - we're looking forward to having he and Kathy as neighbors! Oddly enough, we met David because he represented the seller when we purchased our villa. We did not use a real estate agent to purchase our property in Sea Pines, so we spoke directly with many agents during the process; many were arrogant, pushy, and misleading. When we contacted David, we were instantly struck by how forthright, friendly, and knowledgeable he was. We immediately fell in love with the property, but David himself was also a part of the reason we chose to buy the property we did, going to show that a realtor can make a difference. While representing his client’s interests, David was very helpful throughout the transaction, making numerous recommendations in terms of local companies and services like insurance, contractors, maintenance, and furnishings. Sure enough, as we researched these various companies, David’s recommendations were right on. A couple of months after closing, we finished renovating our villa. David and Kathy kept in contact and were excited to come see the work we had done and continued to offer helpful pointers and tips. We plan on buying another property in Sea Pines one day and there is only one realtor we will use -- David Love. My husband and I started our vacation home search in Hilton Head Island two years before we actually bought anything. We met David on our first house hunting trip in September of 2008. We knew immediately that he would be the realtor that we would work with. After a few days he knew what we wanted on the island better than we did! Over the years he kept us informed of homes he thought we might like and we eventually returned to purchase one. As it turns out the one we came down for was not the one we got, we got an even better house, all thanks to David. We could not be happier with the home or the experience. Being from out of town we didn't quite know what to expect, but David handled everything for us, and was always happy to do it. His recommendations for us have been perfect, from the handyman, to the heating and air conditioning company, he got everything set up for us. And when our moving company beat us to the house, he was there to let them in for us! And his service has not stopped. David still takes the time to send us updates about Hilton Head that would be of interest to us. We know that we can always count on him for anything we may need in the future. I honestly don't know how he does it, but we felt like we were his number one priority throughout the whole house hunting and sale experience, and we seem to continue to be a priority. If you are looking to buy or sell a home in Hilton Head and want a realtor that will happily cater to every single one of your needs, you do not need to look any further. We believe that David Love is the best you can find. Mike and I have been visiting and vacationing on Hilton Head Island for ten years. We fell in love with Sea Pines the first moment we drove down Greenwood drive and knew we had found our future. We began with a small rental villa in Inland Harbor and have since transitioned into a modest 2nd home that we rent seasonally yet still enjoy several weeks out of the year. Kathy and David have been instrumental in providing all-encompassing real estate services that have made our investments on the Island both profitable and personally enjoyable. They take a serious interest in understanding and meeting the objectives of their clients. They live and work in Sea Pines and know this particularly beautiful part of Hilton Head like no other realtor can. We have been able to take advantage of their special position in the Sea Pines real estate market and look forward to the day when we will purchase another property as our primary residence with their assistance. David and Kathy’s knowledge of the market in Sea Pines will serve us as well in the future as it has in the past. We recently purchased a villa in Sea Pines and David was such a wonderful help in the process. He knew what we wanted before we did! But that didn’t stop him from showing us every option there was to offer. With David’s unfailing patience we scouted the whole island and found the best property for us. When we would meet with him, he would give us his undivided attention. Not only was he there for our adventure in island real estate he has also been a wonderful resource for information and a great friend to us. I would highly recommend David and his family to anyone. My wife and I were interested in purchasing a villa at Hilton Head Island for a combination of investment and for our personal enjoyment. David was not the first agent we used, but he was the one we ultimately wanted. We are not the type who make decisions in a hurry. David was not pushy, rather he worked to understand what we were looking for. He also took the time to help us understand the Hilton Head market, providing us with lots of information to help us make up our mind. Thanks to David's commitment to us, we now enjoy our little piece of heaven. I was recruited to Hilton Head Hospital in the fall of 2006, and was relatively uninformed about Hilton Head Island in general and the real-estate market in particular. David and Kathy Love took it upon themselves to make me feel welcome, and then proceeded to share their unique understanding and insights into the island’s geography, lifestyles and culture. It was clear they not only felt the pulse of the real-estate market, but more importantly, knew how to artfully clarify my needs in relationship to available houses on the market. With David and Kathy’s valuable assistance, I purchased a home for my family in the fall of 2007, and continue to look to them for ongoing advice as it relates to the real-estate market. A mutual friend recommended Nancy Love to us. Although we share the same last name, we’re not related. Working with Nancy was a complete joy from start-to-finish. She was friendly, polite and very experienced. From the beginning, Nancy listened intently to what we wanted and showed us a broad selection of properties. She spent time helping us narrow our search and once we found our villa we were thrilled! Nancy made the entire purchase process so easy. She was especially helpful recommending various vendors, such as attorneys, rental companies and mortgage consultants. Nancy is more than a real estate agent; she is a true consultant on many aspects of Sea Pines and Hilton Head Island. The month of August was an important one for my husband and me. We were able to successfully close on our villa that we had been trying to sell by ourselves for several years. As we looked back over the events that finally led us to this welcomed conclusion, we realized that the answer to our prayer was in deciding to use the services of Love Real Estate Consultants. Their assistance, enthusiasm, encouragement, expertise and professionalism played such a critical role in the selling of our villa. Kenneth and I are both exceedingly grateful to David and Kathy for their outstanding service to us. I wanted to personally write to you once again to say thanks and to let you know that we appreciated all the hard work you did to promote and sell our villa. God, with the assistance of David and Kathy, worked a miracle in this tough economic climate! When we first moved to Hilton Head we knew nothing about the island and even less about buying a house. We were first time buyers and we didn't know where to begin. Fortunately we met the Loves who were an excellent guide on our journey. David and Kathy showed us the nuts and bolts on house hunting and the finer points on the difference between buying a house and buying a home. In the end, we got exactly what we were looking for that fit our budget and lifestyle. We never felt pressured, or hurried, and always felt that we were in control. We absolutely love our new HOME! Thanks David and Kathy! David 's commitment to his clients and attention to detail puts him at the top of his profession. When my wife and I made the decision to purchase a home in Sea Pines, David took the time to listen and ask detailed questions about what type of home we wanted to purchase. From our initial meeting, our concerns became his concerns, and with his extensive knowledge of Sea Pines he was able to provide additional insight to help narrow down our selection. Navigating this real estate market was a bit overwhelming at times, but David constantly kept us updated, continued to answer our questions and address our concerns with extreme patience while creating a very relaxed atmosphere. Additionally, his positive energy, ability to see the big picture, and his passion for coastal living made him the clear choice when it came time to select a real estate professional. Working with Kathy and David Love has been a pleasure from initial listing to final closing. We honestly feel the digital presentation they put together for the sale of our home in Sea Pines was far superior to anything else we've seen in the market. The website designed specifically for our home was easy to use, very informative and provided outstanding photography of our property. After many years of visiting Hilton Head Island we purchased a condo in Sea Pines. While on vacation we saw a flier advertising real estate sales. We called Sea Pines Real Estate and were introduced to David Love. He was very gracious to take us to see a condo knowing we were just going to look. He answered all our questions with a great deal of knowledge and gave us honest information. He never tried to push us in any way so we just thanked him and left. While driving home to PA we discussed the condo and had more questions. So we called David. In fact thru the whole process he had to answer so many questions and search out a great deal of information. David has unlimited patience and seemed to enjoy getting answers for us. His extensive knowledge of the area and real estate helped make our decision. Much to David's surprise we decided to put a bid on the condo. Being out of state David handled the whole process for us. We couldn't take a second look at the condo so David did it for us. He took photos, measured everything, checked on what needed to be repaired or replaced. He knew the right person for every job as well as their phone number. With David as our guide he kept us up to date via phone calls and e-mail. He made our experience pleasurable, exciting and a learning process. He is so knowledgeable, courteous, conscientious and also humorous. We feel if you ever have the pleasure of dealing with David Love you will have a wonderful experience. When we went to Hilton Head recently we had lunch with David and his wife Kathy. What a lovely couple! They are both realtors and are perfectly suited for their profession. During lunch David said, "With the purchase of the condo our journey is not over because if we have a question or need anything - just call." We truly feel comfortable about giving them a call because David and Kathy have become friends. ~ I will be Hilton Head Dead.